Helping students identify their school wounds. 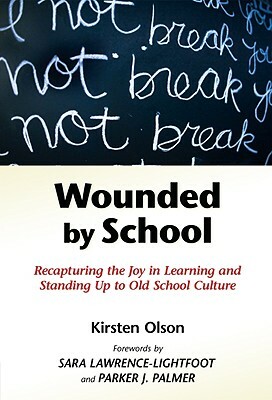 Last year I had the good fortune to read Kirsten Olson’s book Wounded by School: Recapturing the Joy in Learning and Standing up to Old School Culture. So many of the ideas ra ng true, I immediately began brainstorming ways to share them with my students. The activity I developed was for my senior advisees at the time, with the notion that, now that their secondary schooling was drawing to a close, unpacking it would be a useful task in preparation for getting through college. Of course, why not do it earlier, and then reap the benefits yourself? My wake-up call about what students think of learning in my classroom has me itching to do this activity with my freshmen advisees. And possibly with all of this year’s freshmen. I feel detached from learning and zone out a lot in school. I have lost interest in learning experiences I once enjoyed. I feel like my original ideas lack value or are too strange. I often I feel like I won’t be good at new things. I worry that something will go wrong if I don’t follow the instructions or the rules. I try not to stick out. I do things because they will look good for college or my resume, not because I actualy want to. People don’t really know who I am in school — they just make assumptions. I can only achieve so much in school. I don’t feel like I get much attention in school, or that my work is valued. Maybe I could do better, but people just expect me to be average. Once they picked a group, students had time to casually share out: why did they identify with those statements? What were the typical or stand-out experiences that made it clear that’s how they felt? Had they always felt this way? If not, when did that wound form? A lot of students picked “numbness” — senioritis was in full swing — and some self-identified overachievers gravitated towards “compliance.” “Underestimation” and “average” got some takers as well. Those last two groups were initially more reticent to share why they felt the way that they did — but once they got going, they had a lot to say. Perspectives I have never heard before. The conversations were deep enough that this took the majority of an advisory period. I think we asked students to share out their history and current gripes with their wound, and this worked because our advisory family had four years of trust built-in by this point. Part 2 of the activity — complete with drawing! — coming tomorrow. This entry was posted in Curriculum, Ethic of Care, Uncategorized on February 19, 2013 by lpahomov.